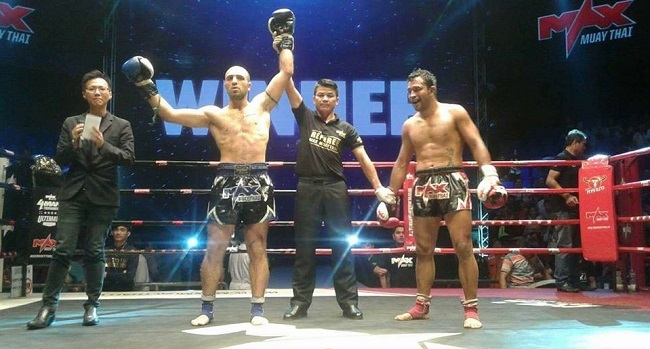 Mohammad Khalil (left) competes in a MAX Muay Thai bout in Thailand. From the curious first-timer to the serious professional, martial artists are drawn to their fighting style of choice for a variety of reasons that often change over time. When I began taking Muay Thai kickboxing classes almost one year ago, my goals were to simply lose some weight, get in better shape, and learn something new after being intrigued by a few kickboxing matches I’d seen on TV. But it didn’t take long for me to fall in love with Muay Thai. And so my goals have since shifted to where I’d like to compete in at least one amateur fight. For Mohammad Khalil, his goal from the moment he stepped into the gym was as clear as it was ambitious. The 24-year-old Khalil, a practicing Muslim born and raised in Norway, wanted to become a champion on the elite level. Which is not an uncommon motivation among fighters, however, Khalil is actually on a realistic path toward reaching that goal. Since turning professional a little more than two years ago, Khalil has compiled a record of 24 wins, six losses and three draws (according to MAX Muay Thai), usually entering the ring weighing between 147 and 154 pounds. He has fought in China, Cambodia, Sweden, Norway, and of course in Thailand, the birthplace of the Muay Thai fighting style. This Sunday, Khalil will be part of a one-night, eight-man championship tournament for the Real Hero promotion in Bangkok, Thailand. “Right now I just want to win that tournament, because I need a (title) belt to make more progress in my career,” Khalil says. Another championship possibility for Khalil in the future could come in the form of Olympic gold. In 2016, Muay Thai was granted provisional status by the International Olympic Committee, meaning the sport’s governing body will receive money annually from the IOC and have the opportunity to apply for grants. Provisional status means the sport’s governing body can petition to be included in the Olympic Games. If that happens in the near or not-too-distant future, Khalil says he’ll be first in line for his nation’s Olympic team. “I will be on it for sure,” he says. In between training, Khalil took some time with Ummah Sports to chat about his life, his religion, and his career. UMMAH SPORTS: When did you first get into martial arts? What attracted you to it? MOHAMMAD KHALIL: At age six or eight, because my Dad did Shotokan (a Japanese style of karate). But I started again at the age of 15. I was getting into a lot of fights in school and outside of school. I was attracted by movie stars like Ong Bak, Bruce Lee, Jackie Chan, Chuck Norris … It looked so cool to be like them. I started to practice Aikido (a Japanese art that focuses on grappling without hurting the opponent) at age 15 and stopped after I graduated to black belt. That took me four and a half years. I wanted to compete and test myself; in Aikido, it wasn’t like that. So I found the closest gym near my home and signed myself up there. (Since then) I’ve been competing in only Muay Thai. UMMAH: When did you realize you were good enough to be a professional? Or was that what you envisioned from Day One? KHALIL: To become professional was always my dream from the start. That was the only thing I was thinking about. Once I got there I was so happy because many doors opened for me. And once I was there, I just wanted to continue. 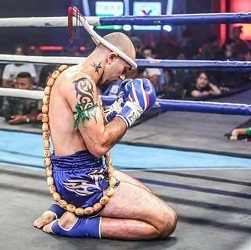 UMMAH: How would you describe Muay Thai to someone who is not familiar with the art? KHALIL: I would say it’s basically you can do everything while standing. It’s an “eight limbs” sport, where you are using hands, elbows, knees and kicks. UMMAH: What are you strengths as a fighter? KHALIL: I’m a fighter that is moving forward all the time. I like to use elbows and punches. UMMAH: Were you raised in a Muslim family, or did you convert to Islam? KHALIL: My family is Muslim. We’re from Kurdistan, north of Iraq, but I was born and raised in Norway. It wasn’t easy for us. We were all working. I started to help and work with my family when I was around 11 or 12 years old. My dad was working as a mechanic in the beginning. After a few years he started to work with delivering newspapers and advertisements to buildings and houses. It was a physical job, because you had to walk or run up a lot of stairs. My dad and my mom both got injured in that job. But me and my brother and two other sisters were working with them as well. UMMAH: Have you visited Kurdistan? KHALIL: Yes, I’ve visited many times. The life over there is very different compared to Norway. Water, electricity and food are limited. It’s hard to make money there. A lot of poverty. UMMAH: What role has Islam played in your life and in your career as a martial artist? KHALIL: My religion has a big role in my life. It makes me think and act differently. Every day I learn something from it. I try to do all my prayers five times a day. Every time before I step into the ring, I read a verse from the Quran three times, and when I’m finished with a fight and come home, I pray. I’m thankful to Allah that he gives me opportunities. UMMAH: Do you observe the fast during Ramadan? KHALIL: Yes, every year I take a break from the sport just so I can fast and spend time with my family. UMMAH: Are there lessons you can take from Islam that can make you a better fighter? On the other side, are there lessons you can take from Muay Thai that can make you a better Muslim? KHALIL: If I keep my faith in Allah, and he will open doors for me. But I have to train hard. It won’t just come like that. UMMAH: What other goals do you have for your Muay Thai career? KHALIL: I just want to be remembered as one of the greatest. UMMAH: Do you think you might try other martial arts in the future? Maybe enter the MMA world? Or do you think you’ll always be a pure Muay Thai fighter? KHALIL: I’m open for trying. I like challenges, so I won’t say it will be impossible. Because I want to be a complete fighter. UMMAH: Is there anyone you’d like to thank or give a shout-out to? KHALIL: First of all, I’d like to thank my mom, because she has been supporting me and she’s there all the time, even when she doesn’t like that I’m doing this (fighting). Giang Hoang was the first guy I got involved with Muay Thai. Eirik Digre is my head coach in Norway that has been working with me since I was a beginner. Fatima Pinto works with me on the basics, and on my food program. Senad Gerzic is my boxing coach; he’s worked many hours with me so I can have hands like I have today. Kevin Aamlid, he runs the (Instagram) page Muay Thai World; he brought me to Thailand and helped start my professional career. Nueng NCL Muaythai, my Thai trainer and manager; he’s been working with me for two and a half years. But just one more thing: If it wasn’t for my prayers and believing in Allah, I wouldn’t be here today. Mohammad Khalil (left) picks up another victory.